Visits to Smith-Madrone are by appointment only. In order to offer our visitors the best possible winery experience, we are open to the public on Monday, Wednesday, Friday and Saturday, with only two appointments available each of those days, at 11:00 a.m. and 2:00 p.m. Please make an appointment here. Our tasting fee is $25 per person; that fee will be waived with a wine purchase. VinoVisit will request a credit card to hold your reservation. You will receive a confirmation email. Our apologies: we cannot accommodate large groups. 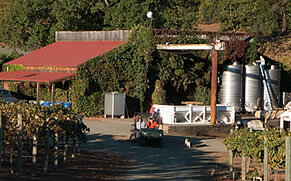 Your visit to Smith-Madrone features a group tasting and tour with our winemaker Charlie Smith. Please be sure to plan enough time to reach the winery on time. The drive from St. Helena to the winery can take as long as 30 minutes. Thank you!